It’s no wonder butterflies have fascinated human beings for as long as we have coexisted. These colorful creatures appear delicate—fragile, even—but perform dazzling feats of acrobatics and endurance, by design. Many members of this diverse family have the strength to withstand whatever nature throws at them, from high winds and heavy rains to frigid winters and sweltering summers. While some species battle the elements across thousands of miles to journey to distant lands, others spend their relatively short lives confined to one place, where they compete for a mate, search for host plants and exploit often-scarce resources essential to their survival. Every plant has a purpose. 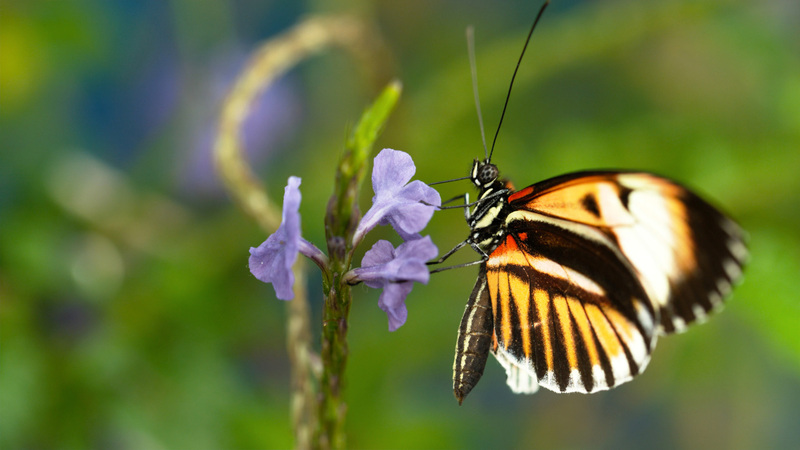 Even if we do not comprehend the value of a specific plant, we should appreciate the fact that plants provide breeding and feeding areas for butterflies, in all stages of their lifecycle. Moreover, each butterfly species is intimately connected to one or a few plant species, upon which its reproduction depends. This means that without milkweed, for example, there will be no Monarchs, because that is the only plant Monarch caterpillars can consume to mature and successfully metamorphose, or achieve their adult form. The caterpillar is the butterfly. People who love butterflies want more of them, and many seek to help increase their numbers by creating breeding and feeding areas for them. Unfortunately, well-meaning people sometimes react poorly when they see “worms” destroying their purposeful plantings. If one has host plants, like milkweed, in their garden, the goal should be not only to attract Monarchs, but have them lay eggs, which hatch as larvae. These hungry, little “worms” are actually caterpillars, the immature form of the butterflies one wishes to entice and increase. Yes, they will devour your plants, but your plants will come back to support the cycle all over again. Sunlight gets things started. Butterflies love the sun and the heat. Bright, sunny days where the temperatures reach or exceed 70 F are the best days for butterflies and butterflying—the act of seeking and enjoying butterflies. If you’re not the type that likes to rise before dawn or stay up late, this may be the perfect hobby for you and it’s healthy, too! So, what are you waiting for? Get outside, absorb some rays, produce some Vitamin D and move your body. Basking butterflies may be your just reward. Nectar, it’s what’s for breakfast, lunch and dinner. Plants, especially flowers, produce sugary fluids in the form of nectar or sap to lure pollinators, like butterflies, bees and bats, into service for them. This sweet stuff is irresistible to the winged wonders that require it, and it reinforces the codependent, symbiotic relationship between living organisms locked in a mutually beneficial dance of procreation. In many cultures, water is life; but for the butterflies and the bees, sustenance comes from something much sweeter. Wild likes weedy. Many of the plants we consider to be a nuisance—those unsightly, unwelcome weeds we seek to eliminate from the iconic American lawn—are the very plants butterflies must have to survive. Unfortunately, wherever we vanquish weeds, we also obliterate butterflies; it’s the worst of unintended consequences. The best way to avoid this is to learn about those pesky, resilient plants endemic to one’s landscape and cultivate some appreciation for them. Butterflies like it wild and “weedy”, so consider carving out some space in your place for more of those varied, hearty and surprisingly valuable natives. Garden like Eden. No matter where one lives, there are plants that should live there, too. The plant species that belong in a particular area are referred to as native plants, and they are perfectly suited to the soil, rainfall, temperatures and wildlife there. In fact, they are the ideal plants for creating a bountiful garden that contributes to a healthy ecosystem. For this reason, we encourage everyone to choose indigenous, rather than introduced or exotic species, when planning a garden; be it for butterflies or otherwise. Then, go the extra yard and keep the harmful chemicals away, lest you accidentally poison the beautiful creatures you intend to nourish and shelter. Marianna T. Wright is the Executive Director of the National Butterfly Center in Mission, TX. The National Butterfly Center is a nonprofit organization dedicated to the conservation and study of wild butterflies. For more information, visit nationalbutterflycenter.org.